Directly onto a course homepage. Within text you edit (i.e. on pages you have created, course summaries, etc.). 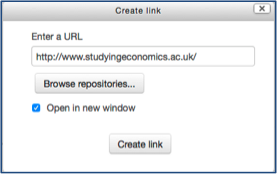 Click Add an activity or resource, scroll down to RESOURCES, select URL and click Add. 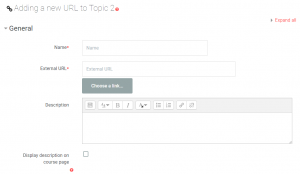 Enter a Name for the link (this is the text the user will click on). 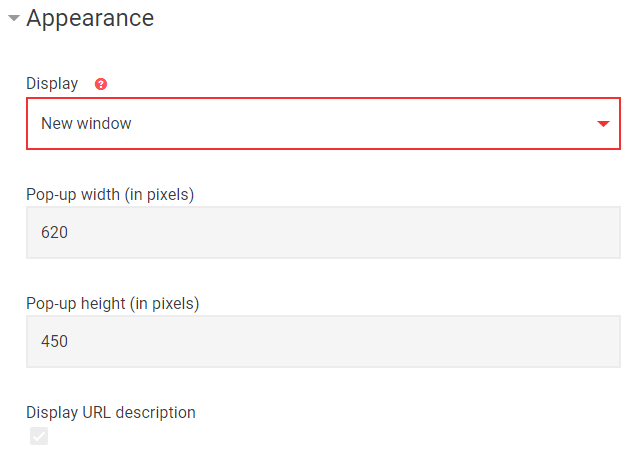 Add a Description if required and select whether to display it. Type (or paste) the link at External URL. Alternatively, you can click on Choose a link… and follow the steps there. In Appearance, make sure the right option is selected for what will happen when the link is clicked. 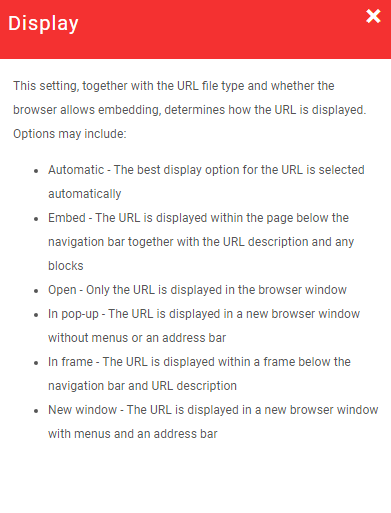 The option selected by the system – New window in this example – is often the most appropriate for the chosen URL. N.B. Always open external websites in new windows to avoid copyright infringements. 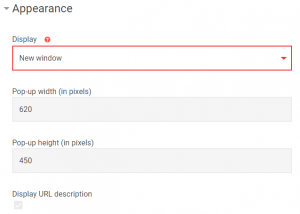 An explanation of other options can be obtained by clicking the to the right of Display. Adjust any other settings as necessary. 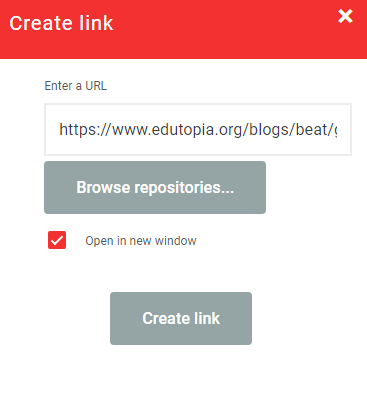 The new link appears at the end of the section and can be moved as required. 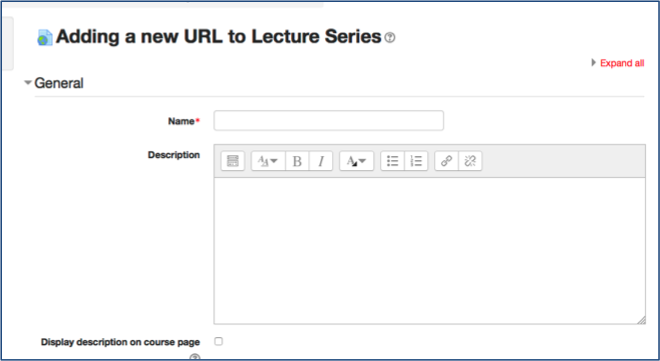 In this example, an external website has been added but it could equally have been an internal link to another part of Moodle. Turn editing on and open any Moodle resource which gives you access to the html editor e.g. label, page, section summary, etc. 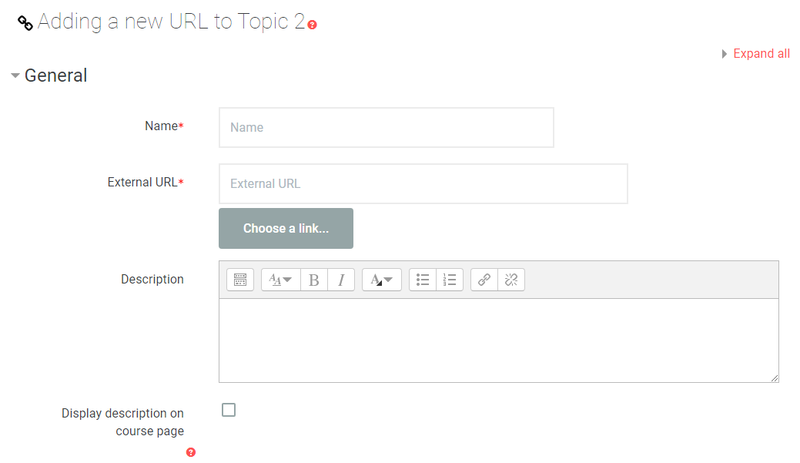 Type in some text and then select the word(s) to which you want the link attached and click the link icon . Paste the URL (copied earlier) in the box at the top. Select Open in new window if it is an external website. Click Create link. 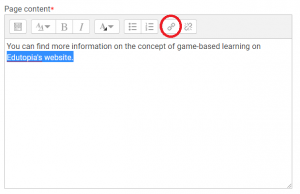 The linked text will now appear highlighted. Continue with any further editing and click Save … to complete the process.